In March of 2014, during a meeting at her synagogue in Lexington, Massachusetts, Linda K. Wertheimer heard about some disturbing incidents of anti-Semitism in the neighboring town of Bedford. Swastikas had been painted on playground equipment, and small children were playing a game they called “Jail the Jews.” The events caused her to reflect on her own childhood in small-town Ohio, where she was on the receiving end of anti-Semitic remarks. After an extensive career writing about America’s education system, Wertheimer, a former Boston Globe reporter and editor, wondered how the education system could help prevent religious intolerance. 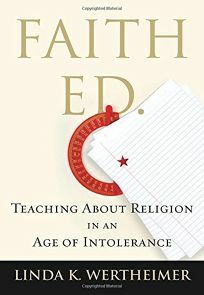 The result was Faith Ed: Teaching About Religion in an Age of Intolerance, a book exploring how religion intersects with education in America’s public schools. Wertheimer suggests that although the old debate over whether teachers can lead prayer in school has been settled, there is a new and equally tense debate brewing about whether and how to teach world religions in schools. Wertheimer’s book covers several controversies that teachers across the country have found themselves caught up in, including one in February 2013 dubbed “Burkagate.” A teacher in Lumberton, Texas suddenly faced criticism after 15 years of allowing her students to try on burkas, hijabs and other Muslim attire. The teacher saw the lesson as an opportunity to teach about another culture, but when photos of the high school students surfaced on social media, some upset parents saw it differently. A teacher in Wellesley, Massachusetts wanted to avoid similar criticism accusing him of forcing students to be involved in religious rituals. In the years before the uproar over how to teach religion, the teacher would typically ask for a volunteer from the class to model tefillin, a ritual object used in Jewish prayer. Since the outpouring of complaints in other instances, he has simply shown what tefillin are—in person or in a photograph. In today’s climate, Wertheimer agrees that teachers should be more careful about avoiding anything that resembles participating in any sort of religious ritual. In the book, Wertheimer wonders how young is too young for children to learn about religion. “I came away feeling that it could start as early as kindergarten or first grade, if teachers are trained in how to handle the subject properly,” she said in an interview. Wertheimer examines the national program Core Knowledge, which ensures that all students have a uniform curriculum from kindergarten through eighth grade. (About 1,200 schools nationwide have adopted this program.) Wertheimer believes that this is a conflict-free way of teaching children about religion, and would be entirely comfortable with her own child learning about religion at a young age. “My son thought everyone was Jewish until we went into a church [for an interfaith event]. He came out of the church and said to me, ‘Is everyone here Jewish? Because I’m not sure they are,’ and I said, ‘No, actually, they’re not.’ We explained it to him, and I see nothing wrong with a schoolteacher, trained appropriately, teaching about this in kindergarten, first grade,” she said. During the writing process, Wertheimer was able to look at the issue through a personal lens, as a Jew who grew up in a small Ohio town. “It certainly shaped the types of questions I had about the topic,” Wertheimer said. To avoid controversies such as these, Wertheimer emphasizes the importance of teaching facts, which helps children learn about the world and other cultures and also may help to dispel stereotypes about various religious groups.